Leaked Sketches Show All-Electric Audi R4 Spyder. Is It Real? The Internet is often full of tip-offs, spyshots and conjecture about everything from governmental policies to new car models. With the Paris Motor Show just weeks away we’ve seen all sorts of rumours and predictions about vehicles that we’re likely to see there. But the rumor mill has been working overtime for one company in particular: Audi. According to several websites, Audi will be unveiling a concept car based on the R4 Audi E-Tron concept which was unveiled in Detroit earlier this year. At the moment though, all we’ve seen are a few sketches, and this mysterious video of a camouflaged Audi (possibly an R4) being airlifted into a Ski Slope near the Austrian/German border. The German company was in the news last week with rumors that it planned to reveal a concept car to celebrate the 30th anniversary of the world-famous four-wheel drive Quattro. Sadly, that vehicle is expected to have a conventional gasoline engine in it. Somewhere between a 2011 Audi TT and 2011 Audi R8 in size, the R4 two-seat concept cuts a mean stance and certainly fits well into the current Audi design ethos. While there are no details as yet on the performance of the R4 E-Tron Spyder, we’d like to guess the drivetrain and battery system will be a little slower than the jaw-droppingly beautiful R8 electric Audi E-Tron we saw earlier this year at Le Mans. 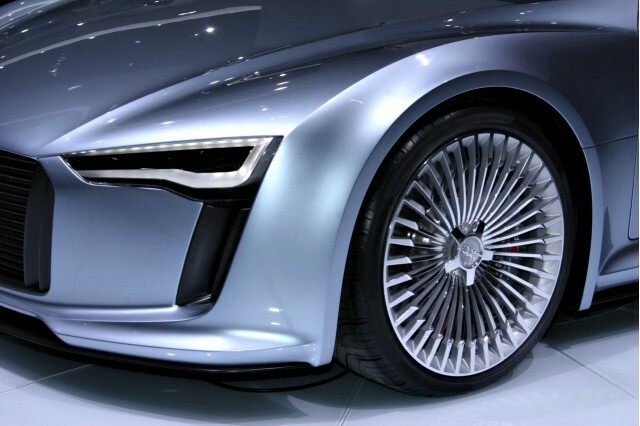 The R8 E-Tron’s performance is thanks to a massive 233 kilowatts (313 horsepower) of all-wheel electric drivetrain, a 0-62 mph time of 4.8 seconds and over 500 lb-ft of torque. The R4 concept shown at Detroit in January earlier this year featured a more modest 150 kilowatts of power (200 horsepower) from a rear-wheel drive system. 0-62mph being achieved in 5.9 seconds. We're expecting the Spyder to share the previous R4 concept's drivetrain. However, there are no confirmed technical details leaked with the sketches. The only other thing we can tell you with certainty is that the R4 E-Tron Spyder lacks a solid roof and features a wraparound windshield. Will there be a fabric roof? We’re not sure. But if the sketches are anything to go by, the car brings all-electric vehicles to a new level, bringing electric cars to a wider market segment than the 2011 Tesla Roadster can cater for.